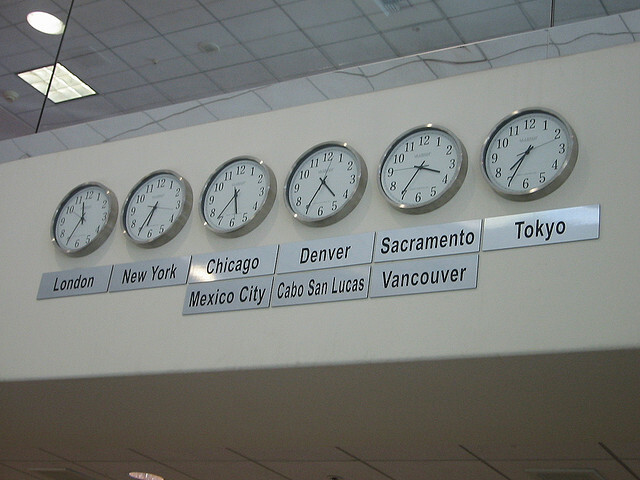 Not too long ago, I sat in an airport and looked up at a row of clocks on the wall much like those in the photo here. An idea had its seeds planted with that sight. When I was younger, I watched the movie Dead Poets Society, where Mr. Keating challenged me to look with a new perspective. Although I have climbed up on some desks to look at rooms differently, I now take this concept into everyday life. Both of these concepts came together with the clocks. As I sat there, I wondered how fun it could be to have a wall of clocks with fictional locations. That idea sat in my OmniFocus app from April to July. Then I prepared for a Wacky Weekend with the 5th-8th graders at my church and it resurfaced. I used GroupMe to message a few of my friends in FourFiveSix for their favorite fictional locations, without giving them any explanation or context. I then found six analog clocks at Target that were all the same style, with different colors for their case and hands. I put each clock on a music stand on stage with a fictional location label for each. In a room where students had recently pointed out that has no clock, we now had six! When that weekend finished, I decided to let that creative, fun idea live on . . . in my office. So, I now have my wall of clocks featuring fictional locations. And most people who come in the room and hear all six clocks ticking away the seconds, do a double-take as they look up at the wall and see the labels. I guarantee it inspires creativity! One more thing . . . I always loved when Steve Jobs would say those three magic words in a presentation. He had saved something good for last. 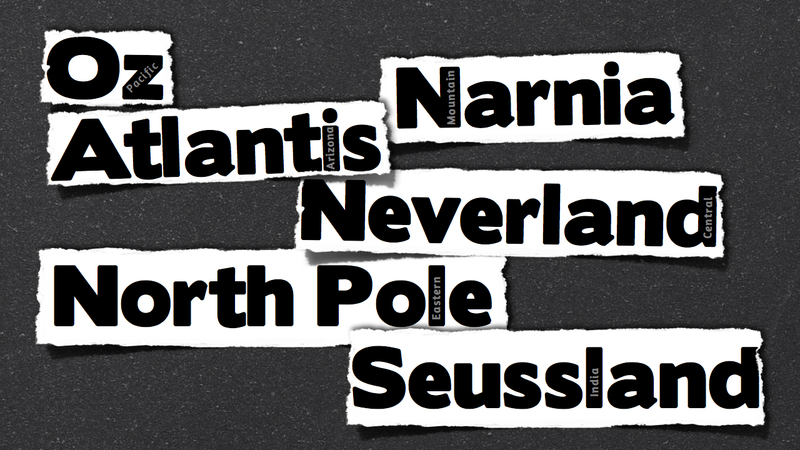 I’m all about the fun of having fictional clocks for creativity, turning something ordinary into something unusual. But these also have a practical use. Although you can’t see it in the picture, and most probably don’t notice when they visit my office, each fictional location also represents a real location where I have friends or family. When I’m sending a message or making a call, I need to remember what time it is for those in each location. In my mind, I know what each represents. But for the careful observer, that is easy for anyone to see . . . like a hidden scene after the end of credits in movies. So I leave you with this question: How can you foster creativity by making the ordinary unusual?